What information do they convey? Which one gives the most information? On the face of it, what they all have in common is that they show nothing at all. 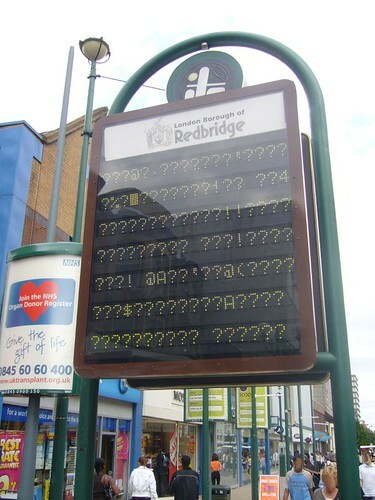 True, the last one shows a lot of question marks, but anyone in the town centre looking at that electronic noticeboard wants answers, not a load of question marks. Contrary to first impressions though, these show, or possibly show, a great deal of information. 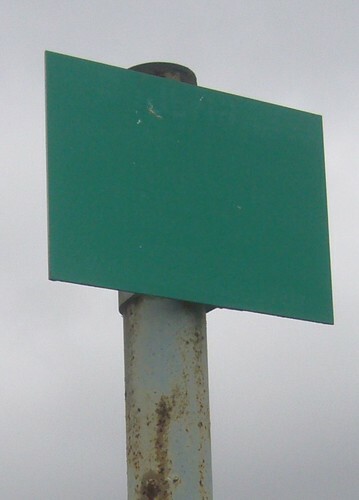 The first and second photographs informs us that these signs have either weathered, and not been replaced, or have been put up in an incomplete state. 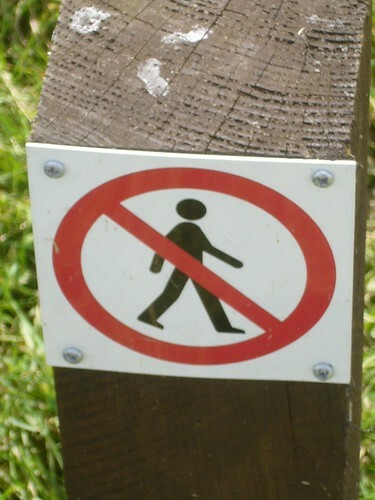 They may even have been erected as a joke, perhaps inadvertently, similarly to the “Please do not throw stones at this notice” type of signs, such as the one shown here. I should think the most likely explanation is the one about weathering, so a geography teacher could use the pictures as a starting point to talk about weathering, perhaps, or a design and technology teacher might use them as a starting point for talking about the properties of different sorts of materials. The third photo could be used as a starting point for discussion about reliance on such sources of information. It’s actually a good thing that the noticeboard so obviously contains nothing of value. A week or so ago I was travelling on the tube in London, and at one station there was an electronic indicator which stated that the next train was a Hammersmith & City Line. Every so often, however, there was an announcement over the tannoy to the effect that the electronic signs were out of order. Anyone hoping to board a Hammersmith & City Line train but who didn’t hear those announcements (because much of the time they seemed to coincide with the roar of a train entering the station) was doomed to wait a very long time for a train that would not arrive. It’s a bit like the old riddle: which is more accurate, a clock that keeps losing time, or one that has stopped? The answer is the latter, because at least that’s correct twice a day. 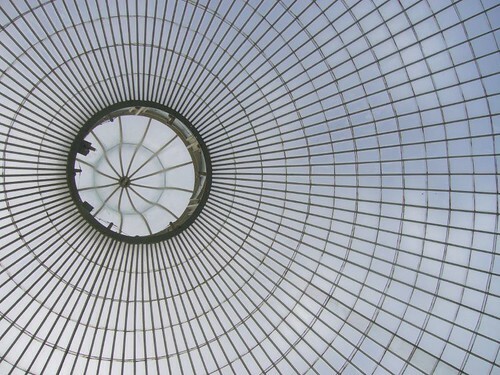 But fables have abounded about virtuoso artists creating perfect circles without a stencil or compass. Take Apelles, a renowned ancient Greek painter who visited an island and the empty studio of a fellow artist. Apelles drew a perfect circle on the studio wall in lieu of a written note, confident that the circle would prove a virtual signature for his great name. A similar thing happened to me once, whilst I was at university. Returning to my room one afternoon I discovered a blank sheet of paper that had been slid under the door. I immediately went over to my girlfriend’s place. She had never done that before, and never did it again, but somehow I knew that it must have been her. There’s a humorous variation (but with a sting in the tale) on this theme. The folk hero Mulla Nasrudin arranged to meet a professor, but forgot. The professor, annoyed that he had made the journey to Nasrudin’s house in vain, left a note pinned to the door which read “Idiot”. I’m sorry I forgot our appointment, but as soon as I saw your name on the note on my door I hurried over straight away! It’s pretty obvious what it’s saying, no matter what language you speak, so there’s no need for any embellishment. Indeed, adding any explanatory text would probably detract from the message by introducing ambiguities. This is a bit of a trick question, really. It’s the first signpost, but you couldn’t know that unless you’d been to see it. 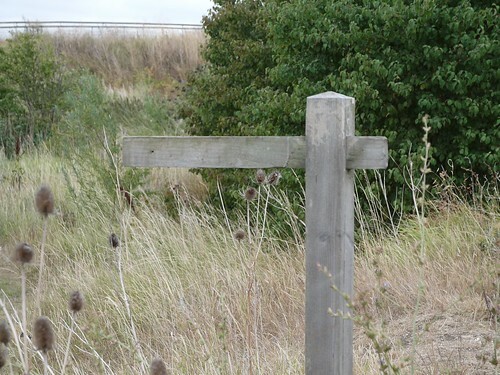 It is situated at a fork in the path in Rainham Marshes. To the right, the path leads to who-knows-where? To the left, it leads to the exit, café, shop and toilets. So when you see it in situ, it’s quite obvious what it’s pointing towards. What can we conclude from these ruminations? Well, to start with, I think there’s a case for making signage on school noticeboards and in technology (and other) areas fairly minimal. I also think you could use the photos as a starting point for some interesting discussions, as I’ve already said. Finally, I think we can use these photos as a metaphor for minimalistic approaches in general. What makes Twitter so powerful? The fact that you have only 140 characters in which to say anything. Ditto SMS messages, where you have just 160 characters. Lao Tzu, author of the Tao Te Ching (Way of Life) recognised the value of the ultimate in minimalism, nothingness, if we wish to wax philosphical. We live in a world of information overload, but we can increase the signal-to-noise ratio by thinking, very carefully, whether we need to include all the data we could.